Tie in 4-5 fibres from long partridge hackle. Keep tail just shorter than hook length. Make body by teasing out wool and using as coarse dubbing. Start infront of tail and wind thread forward to 1/3 distance from eye. 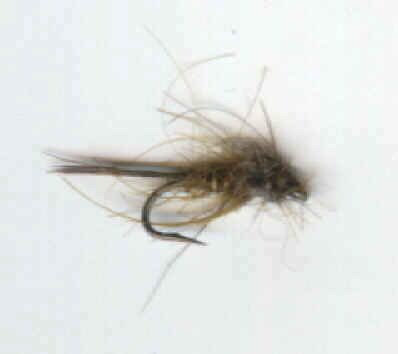 Use coarse fur dubbing to create fluffy thorax, mixing first few throws with the olive wool dubbing. Tie in behind eye. Use dubbing needle to pick out fibres to give impression of legs.